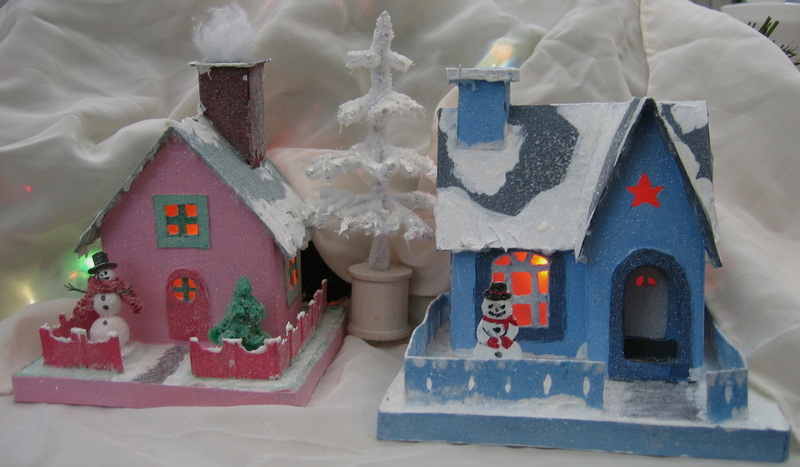 Make a vintage snow village with cardboard glitter houses reminiscent of the Putz houses sold in dime stores from twenties to the fifties add pipe cleaner trees and inhabitants. The projects are simple but do require patients and dexterity and the ability to use a sharp X-Acto knife wire cutters and needle nose pliers. Glue, tools, patterns, paint and glitter snow are provided but students need to bring materials to build the houses. Construction materials for the houses consist of cereal box cardboard and found objects students are encouraged to bring personal items to customize the project. The class meets two days for two hours each. The first day of the workshop the first day is house building and the next week is decorating.